A day in the life of a physician can be hectic. It doesn’t matter if you are in training, established in clinical practice, or whether you’re in an inpatient, outpatient or emergency room setting — providing high-quality, clinical care can lead to feelings of being hurried, rushed and even frenzied. In the clinic, we dart from door to door, room to room and patient to patient. In the hospital, we play detective to retrieve sometimes elusive elements of the history and physical exam, review laboratory data, and determine diagnostic and treatment plans. And in the emergency room, the challenges of providing care with noise, distraction and varying patient illnesses can be overwhelming for clinician and patient alike. Although clinical practice demands that we multitask, constant shifts in activities lead to substantial cognitive and physical pressures that can increase stress and undermine clinical performance. Evidence of cracks in our ability to deal with these stressors is emerging. 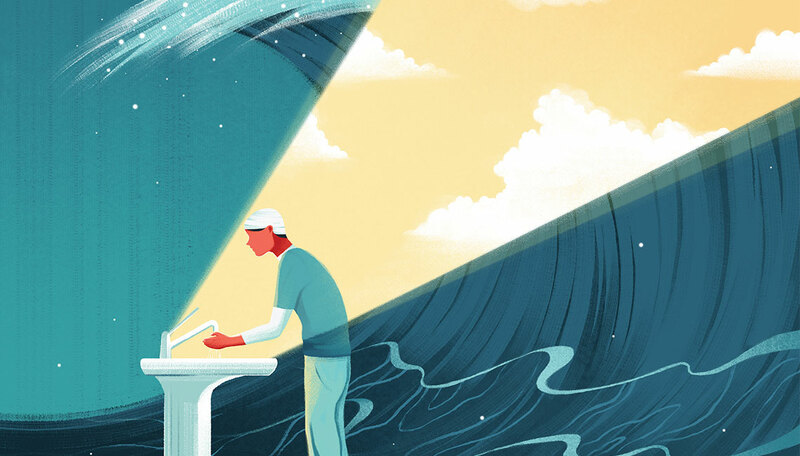 Rates of physician career satisfaction have reached an all-time low, burnout and substance abuse among medical students have reached alarming highs and evidence of harm from providers not having enough time to think is growing. To mitigate these harms, strategies such as metacognitive reflection have been proposed. Use of diagnostic checklists, differential diagnosis expanders and de-biasing apps are but a few examples of interventions based on this approach. Yet time to learn, understand and enact these techniques often doesn’t exist for busy physicians. Mindfulness might be a solution to this challenge. Originating from early Buddhist teachings, mindfulness is a way of being that encourages openness, patience and acceptance to an unfolding situation, encouraging a mental state focused on the present moment. Accumulating evidence suggests that mindfulness-based interventions improve symptoms of anxiety, burnout and depression in health care providers. They also engender attitudes of curiosity and connection, allowing providers to listen attentively, recognize errors, refine skills and clarify values. Importantly, mindfulness also fuels “heartfulness,” a state in which kindness and compassion surface to guide one’s actions. Even during frantic days, islands of mindfulness may be established within oceans of chaos. One such oasis is when we wash our hands before laying them on a patient. The sound of water flowing over one’s hands, the feeling of soap or alcohol gel, and the brief pause offered by hand hygiene before entering a patient’s room culminate in an ideal moment to slow down, reflect and remember what a privilege it is to care for others. Additionally, the positive, internal feedback experienced through a mindful moment of hand hygiene may also boost hand hygiene compliance, a practice that is notoriously difficult to improve. This hypothesized “mind-hand” connection is precisely the topic of an ongoing pilot study at the VA Ann Arbor Healthcare System. Using a randomized controlled trial design, we implemented an intervention that provides a brief introduction to mindfulness to one medical team. We reasoned that they would experience not only greater mindfulness (assessed through a standardized scale), but would do so by demonstrating higher rates of hand hygiene. While the study is ongoing and final data are not yet available, two early observations warrant sharing. First, based on a standardized mindfulness survey, over 40 percent of trainees indicated that they already practiced some form of meditation or self-guided reflection. Second, the trainees uniformly responded positively. The mere act of having a moment to slow down during the day was welcomed — and the opportunity to do so during hand hygiene was viewed as opportune. At some point in our careers, each of us will struggle with balancing competing demands on our time. Incorporating mindfulness into our clinical duties might be one way to help restore equilibrium. The results of our ongoing study will help us understand not only whether mindfulness improves hand hygiene, but also whether it impacts physician resilience and well-being. If so, our next steps would focus on how best to implement mindfulness within our clinical days in order to ground and center us. Indeed, several mindful moments a day might help keep not just the patient but also the doctor healthy. Vineet Chopra is an assistant professor of internal medicine and chief of the Division of Hospital Medicine at Michigan Medicine. Sanjay Saint is the George Dock Collegiate Professor of Internal Medicine, chief of medicine at the VA Ann Arbor Healthcare System and director of the VA/U-M Patient Safety Enhancement Program.